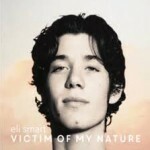 Share the post "Album review: ELI SMART – Victim Of Nature"
You might well ask – who on earth would give up the tropical surrounds of a Hawaiian island upbringing for the gritty, grey landscape of working class Liverpool in order to hone his craft ? And the answer would be a very enterprising and talented young man called Eli Smart. Now 19 years of age, budding singer/songwriter Eli grew up in a ridiculously musical family in Kaua’i and literally put his teeth marks in his first ukulele at the age of three. With a jazz-singing mother, multi-instrumentalist father and grandfather and a grandmother who is enjoying a re-birth of sorts with Summer of Love, all-girl band, Ace of Cups, it is perhaps not surprising that Eli’s music defines the concept of an old head on young shoulders. Having completed a high school project (at age 16!) to faithfully re-record songs from Rubber Soul and Revolver using as close to the original techniques as possible, playing all the instruments himself (and singing too) in his bedroom, Eli went on to complete his first band album of original compositions with his Hawaiian mates (the band was OCDC and the album was ‘Picture Me Sideways’) in 2016. His first solo album release came in 2017 with the excellent ‘Victim Of My Nature’ – to say this guy is already prolific would be an under-statement. Like anyone serious about perfecting their songwriting skills, Smart impressively upped sticks and re-located to study at the Liverpool Institute of Performing Arts (LIPA – lead patron, a certain Sir Paul), nothing like going right to arguably the source of the best pop song-writing in history. There was already a lot of music under Eli’s belt prior to going to Liverpool but there is still an undeniable Britishness about his work as he combines day-to-day narratives reminiscent of Squeeze with Beatle-like harmonies, Paolo Nutini grooves and the pure pop sensibilities of The Kinks – all underpinned with a somewhat inevitable but always welcome Jack Johnson island-vibe. Title track “Victim of My Nature” shows Smart’s appreciation for a neat, stripped-back riff which builds to a catchy shin-kicker of a track. “By Genre”, “Revolve” and “Midnight Blue” attest to Smart’s ear for a melody – very easy on the ear and very hard to do well. And it’s that ingrained maturity of ideas combined with Smart’s cheery cadence that strongly suggests we have a future star in the making. A dry sense of lyrical humor runs throughout the impossibly catchy “As Sure As My Sunburn Every Summer” and “Give It Up To Your Uncle” but he can also do angst in the slightly darker “Nada”. In keeping with a good millennial making his way in the music business of 2018, Smart is also drip feeding new music as a follow-up to Victim of My Nature and “Melanie” and “Lonely Girl”, both recorded this year in Liverpool, are both hum-in-the-shower, velcro-sticky memorable. This entry was posted in ALBUM REVIEWS, ALBUM REVIEWS (Mobile), All Posts and tagged Ace Of Cups, album, Beatles, Eli Smart, Kinks, melodic, pop, review, Victim Of Nature. Bookmark the permalink.